← Dale Yu: Review of That’s A Question! 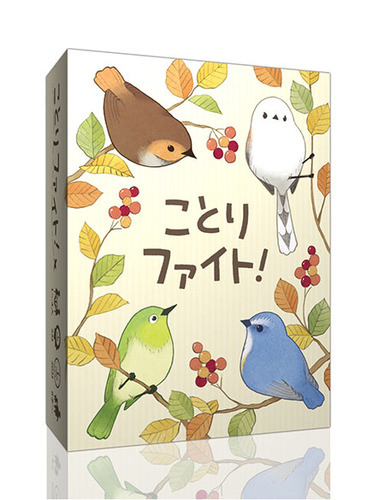 Birdie Fight is a Japanese game where different birds are fighting for dominance of the forest. 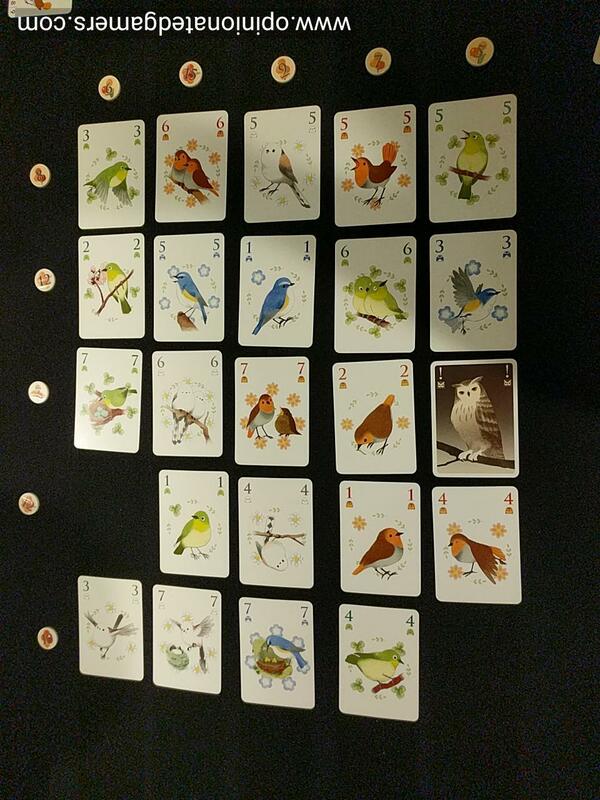 You will be playing cards with birds on them to fill in that square forest – all players choose a secret type of bird for their scoring though. The game is made up of 29 cards. 4 suits of bird cards, each numbered from 1 to 7. The final card is a special owl card. There are also 10 scoring chips with varying values from 5 to 15. These are shuffled and then five each are placed in a row and a column so as to create a 5×5 grid for play with each row and column having a scoring token associated with it. The tokens are now revealed to show what score goes with which row/column. The deck of cards is shuffled and one card is placed in the exact center of the grid. The rest of the deck is dealt out as evenly as possible – 13 for 2p, 9 for 3p, 7 for 4p. On a turn, a player must play a card from his hand to the board; it must be placed orthogonally adjacent to at least one previously played card. This continues around the table until the grid is filled. 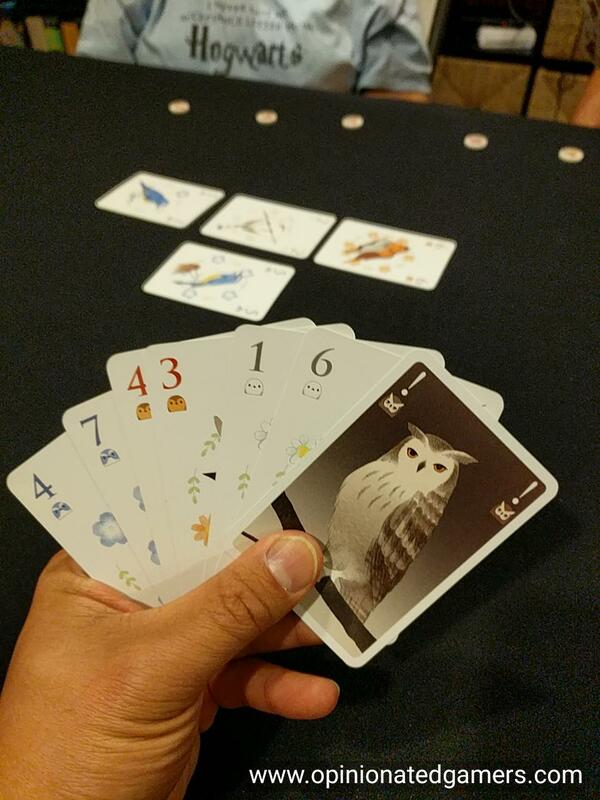 The owl is the one special card here – when it is placed, it replaces one of the cards in the play area; that displaced card is immediately played in a legal spot elsewhere on the grid. When the grid is filled, each player will have a single card left in their hand. This card represents the player’s favorite bird – and this is the color bird that will score points for them in the round. To score – look at each column and row. In each, the color which has the highest sum of cards will collect the scoring token. If there is a tie for highest, all tied colors are eliminated and the chip goes to the next highest color. If all colors are canceled out, no color gets the chip. 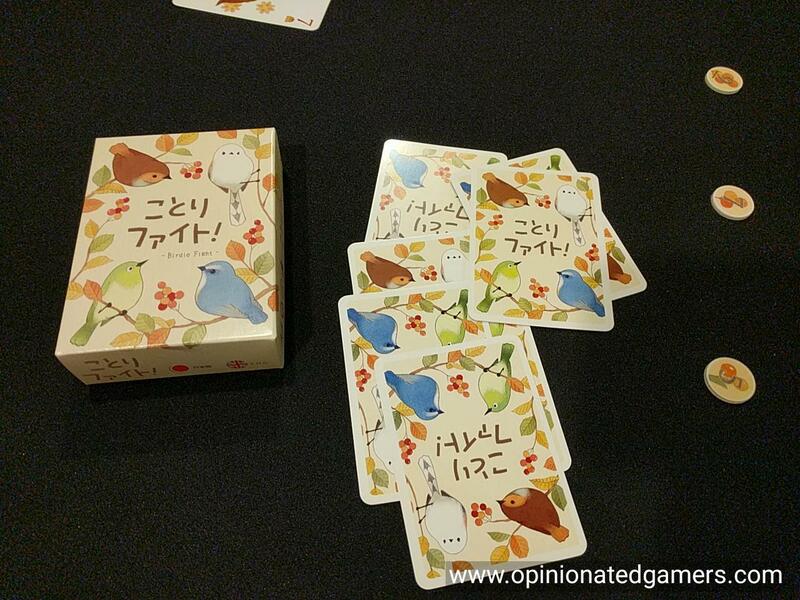 Place the chips on the illustration on the box to keep track of which color bird gets which points. Each player then scores the total of all the chips of his favorite bird color and adds to it the value on the card that he has left over. Repeat this for two rounds and the player with the highest total after two rounds is the overall winner. 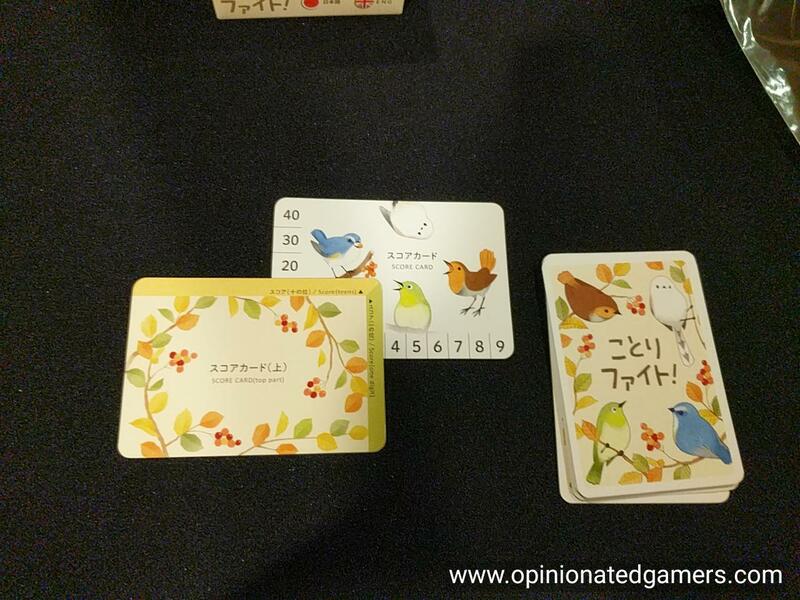 What a beautiful minimalistic game – like many Japanese things, small format and elegance are prized qualities… and Birdie Fight fits those criteria for sure. It comes in a small deck box, and there is a lot of game in that small package. It’s a challenge on the first few plays to really feel how to play your cards well. I think a lot of this is due to the fact that you don’t have to settle on your scoring color until the end of the round. It is probably helpful to have a plan at the start of the round based on the cards dealt to you, but you should definitely think about keeping your options open during the early play in case you change your mind. I have found that trying to avoid voiding myself in a suit early on is the best play for me – that way, I still have the ability to change my mind later in the round if the board ends up suiting a particular color better. While it is possible for each player to choose the same color – that is highly unlikely because that would also mean that very few cards for that color would actually get played to the board; and as a result, that color likely couldn’t win more than 1 or 2 rows on the board. This gives an interesting twist to the strategy, and one that favors the player last in turn order. If there is a promising start to a particular color, say it has high value on the 12pt or 15pt rows, players will want to keep that color; but as I said earlier, not everyone can do this or else the color will simply not have enough cards on the board to score well! In this game of chicken, being later in turn order is obviously better as you will have more time to see what happens before you have to decide. Also, depending on where you are in scoring, you might need to zag – if you are trying to catch up to someone, you may need to try to figure out what color they are going for and then head in a different direction. Because, if you keep the same favorite color, it is impossible to make up more than 6 points on a person – as you will each get the same base score for that color. It is nice to have the owl in your hand as it gives you much flexibility, but it’s honestly not easy to figure out when to best play the card! It seems like it would be a slam-dunk of a decision, but it is sometimes hard to get the right combination of timing. Don’t forget that you need to have an empty space to place the moved card into. The scoring is simple, and the cancellation of tied high scores (as well as the owl) can lead to some interesting placement decisions near the end of a round. Whether by choice or by happenstance (i.e. the last card play of a round) – ties can form and can be devastating to the strategy of particular colors! My only real criticism of the game is that I’m not a fan of the two-card scoring system. I realize that for cost purposes, it’s an easy way to give people a way to score… but the dang cards are hard to read, and they always seem to be bumped/jostled by arms that are trying to play cards and it’s a problem if you don’t remember what your score was when you need to reset them. I’d definitely recommend just keeping score on paper or on a phone app. James Nathan: I found Birdie Fight quite interesting. As Dale said, the hand management zagging as the game progresses is a great feeling – there’s a constant tension of which colors do I expend, how low/high of a coordinate do I place it on, and what colors/ranks does that leave in my hand. It’s not a card game where you can look at your initial deal and feeling confident or feeling hosed, come up with a game plan – maybe a prelude, but you will need to improvise. I am, however, full of apprehension about the owl. Played at the right time, the size of the potential swing it could make in two rows and two columns seems antithetical (hold please; saving that word for a different upcoming review) …seems opposed to the careful hand management that I’ve spent the game tending for. In theory, this is balanced by the Owl player having the disadvantage of one less color card in hand to save for scoring, but I’m still left a little uneasy.